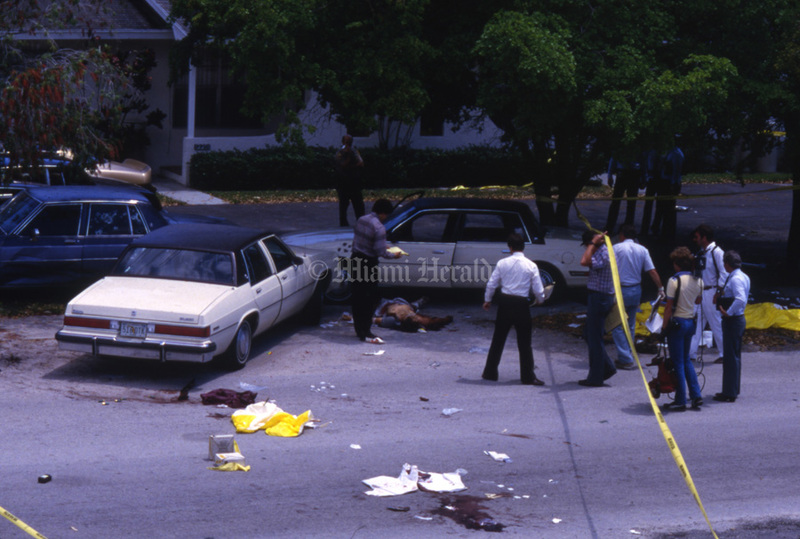 FBI agents and two suspected bank robbers exchanged at least 131 shots during the April 11, 1986 shootout on a residential South Dade street that left two agents and the two gunmen dead. Forty of the bullets were fired by Michael Lee Platt, a former U.S. Army Ranger, who carried a rapid-fire, .223-caliber Ruger Mini-14 assault rifle. Four of Platt’s shots killed agents Gerald Dove and Benjamin Grogan at near point-blank range as they crouched behind an FBI sedan after a chase through the streets behind the Suniland Shopping Center on South Dixie Highway. They were both shot in the back. The Miami shootout was a defining moment in FBI history. The bloody battle led the FBI to better arm its agents, giving them bigger guns with more ammo, as the agency vowed to never again allow its agents to be outgunned by bandits. Hundreds of other law enforcement agencies followed suit. Bodies lie near wrecked, bullet scarred cars after gun battle between FBI agents and two robbery suspects. FBI agents Ben Grogan and Jerry Dove and the two bank robbery suspects were killed. 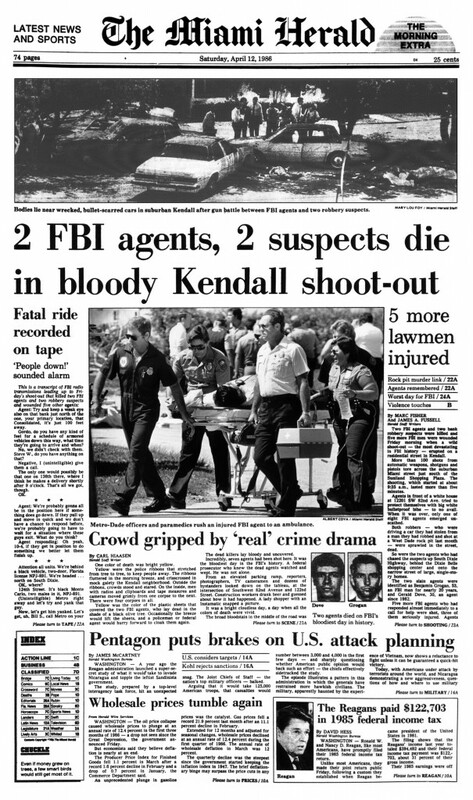 Five more FBI men were wounded in the shootout Friday, April 11, 1986 on a residential street in Kendall just south of the Sunniland Shopping Center. 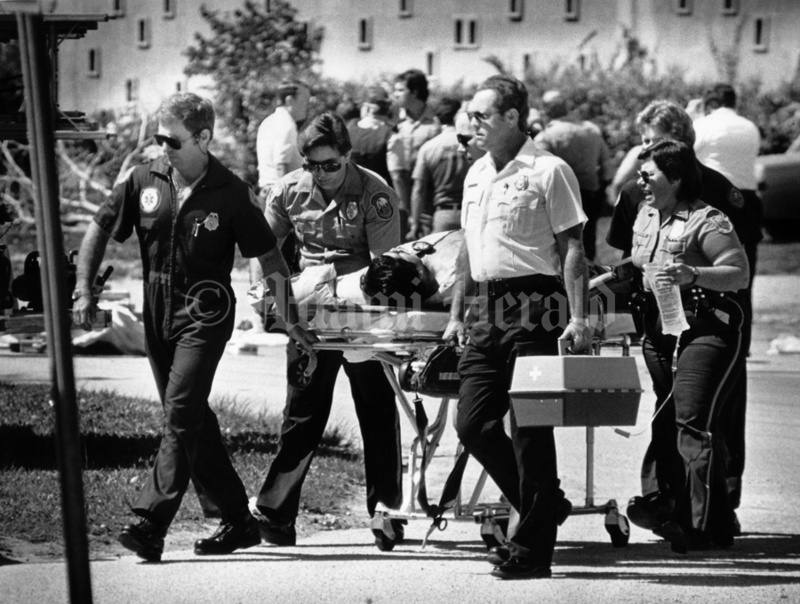 Shooting victim is taken by rescue personnel 4/11/86 in Suniland area of south Dade after a shootout where two FBI agents lost their lives. Buy historical photos in our store! Miami Herald Store features over 1,000 available historical photos. Browse our many collections & find the perfect print for your home or office display, framed and matted. You can even create a photo canvas, mug and t-shirts.